With the announcement and release of the HMT-1Z1 ATEX Zone 1 certified head mounted tablet, the first question is “how will ‘x’ software work on a head mounted device?”. This is a good question as the HMT-1Z1 is a device which has few parallels in the consumer market and therefore can be hard to understand from a development and use standpoint. How Will My Software Appear? Usually, the first question is – “how will my software appear on the head mounted display?”. The answer to this is actually a relatively straightforward one as the HMT-1Z1 simply displays it as it would appear on any Android-based tablet or smartphone. How Will My Applications Work? With the developer tools, which are made available with every HMT-1Z1, software can be quickly and easily converted so that each navigation option on the visual display and assigned a voice command. Using these voice commands, the operator can switch between applications, change values in a system and carry out any work that a user traditionally does on a tablet or even with pen and paper. Additionally, all applications are able to be used without an internet connection. Can The HMT-1Z1 Hear Me In Loud Environments? The HMT-1Z1 is specifically designed to be used in hazardous and rugged environments where machinery is being used creating a very loud environment. The HMT-1Z1 uses four microphones and advanced algorithms to perform noise cancellation prior to voice recognition. This enables the user to use the device in its entirety even in environments with 95 dBA of typical industrial noise. 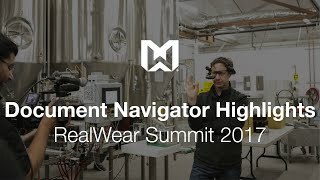 What Applications Are Available Now On The HMT-1Z1? Companies are transforming work instructions from paper manuals to digital formats that improve worker productivity and reduce operational errors. 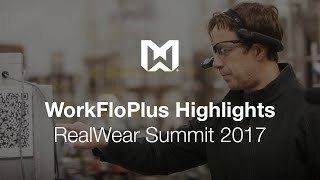 Workflow solutions on the RealWear HMT-1 enable workers to reference text, visual and video based instructions, complete checklists, perform inspections, enter data and capture images while on the go. 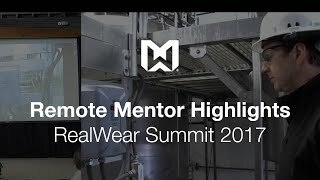 Remote Mentor solutions on the RealWear HMT-1 enable workers in the field to get assistance from experienced technicians (“mentors”) via a video call. The HMT-1, with its high-performance HD camera and class leading noise cancelling microphones enables mentors located anywhere in the world to see what the worker is seeing, hear them clearly and coach them in real-time. Workers have their hands free to immediately perform the steps that they are being coached on. Document Navigator gives workers in the field access to technical information in the right place at the right time. Installation instructions, wiring diagrams, construction drawings, exploded assembly diagrams, safety procedures, cutaway drawings and other critical information are accessible. QR codes attached to physical assets can be scanned by the HMT-1 camera in order to bring up the exact document view needed for the task at hand, on the 7-inch equivalent display. Hands-free access includes voice driven zoom and head movements for panning, an intuitive experience.